This is a list of Test Cells and Unused Cells in Skyrim's data. They may be accessed by typing coc [editor ID] into the console. Multiple cells may share a name, but not an editor ID. For some cells, it may be necessary to toggle clipping (console command tcl) to reach certain areas. Holding cells exist in order to hold items until they are needed by a quest or something else. This interior cell, added by Dragonborn, contains a DLC2dunInstrumentNPC. This interior cell, added by Dawnguard, has stone walls of Dwemer architecture. On one end is a table with the Aetherial Crown, Staff, and Shield, plus an Aetherium Crest, with a duplicate Crest that cannot be picked up by the player. This interior cell, added by Dawnguard, has a wooden table in the middle. On top of the table is an Initiate's Ewer and four books: Unknown Book, Vol. I through Vol. IV. It is impossible to take these books; they play the correct audio yet cannot be taken. To the left of the table is a safe which holds some Dawnguard-specific books, the list of which can include Elder Scrolls. This interior cell, added by Dawnguard, is similar to Soul Cairn architecture. It contains a number of small, ruined towers, with some scattered human bones, piles of human bones, and a few dead trees. Far beneath this is a tiny cave room. This interior cell has a number of wooden tables in it. In the southeastern corner is a naked woman with Vaermina's name and voice, but she is disabled and may not appear. In the northwestern corner are three chests: Zaynabi, Atahbah, and Ma'jhad's Merchant Chests; all three are Thieves Guild fences. On the table in the northeastern corner are a keg of Black-Briar Mead, the Goldenglow Bill of Sale, Gallus's Encoded Journal, and Gulum-Ei's Confession. To the right of this table is a safe containing gold, jewelry, gems, special loot, and ingots. In the middle of the room is a set of five tables pushed together. To the left of these tables is an unsupported door. 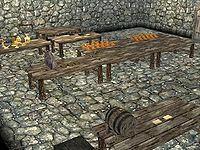 The southern two tables hold twelve Stones of Barenziah each, neatly aligned in rows of six. On the middle of the three northern tables is the Skull of Corruption. The easternmost table has three satchels on it: Verner's Satchel, Sylgja's Satchel, and a Satchel of Moon Sugar. Klimmek's Supplies, a sack, lies on the table as well. Also on the table are Sinderion's Field Journal, a bottle of Black-Briar Mead, a bottle of Honningbrew Mead, and Firebrand Wine. Two more occupied tables are just north of Vaermina. The western one has The Nightingales Vol. 1, The Nightingales Vol. 2, Nightingales: Fact or Fiction?, Shadowmarks, Promissory Note, and Goldenglow Bill of Sale. The eastern one has Chillrend and all items involved in the quest The Burglary Job. There is another table to the south, but this has nothing. This interior cell, added by Dragonborn, contains a Dremora Merchant, a Dremora Butler and a merchant chest. 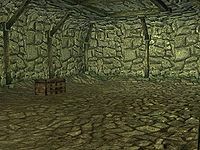 This interior cell, added by Dawnguard, is modeled like a Nordic barrow. It is a single square room with two very short hallways with dead ends. This interior cell has stone walls. It holds M'aiq the Liar, but he is disabled and does not appear. This interior cell has no ground. It holds a number of specific markers and an Ancient Dragon. This interior cell, added by Dragonborn, holds an unlocked, empty, unused safe. This interior cell, added by Hearthfire, has no ground. It holds a number of chests, an NPC called Fish Hatchery, and several NPCs called Planter. 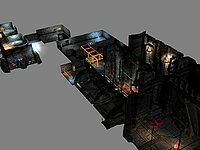 This interior cell, added by Dragonborn, has a tiny platform, a black book effect, and a number of markers relating to the Dragonborn add-on. This interior cell holds an Unowned Chest, which contains an Amulet of Mara. This cell is also used in a Creation Kit tutorial by Bethesda: "Creation Kit Tutorial Series - Episode 1: Introduction to the Kit"
This interior cell holds the Merchant Chest for the two Peddlers; it is empty. Test cells are used to test how things look, work, or interact with each other. This worldspace contains a number of cells, just as Tamriel does. To reach these cells, type cow CWSiegeTestWorld x,y into the console. Typing cow CWSiegeTestWorld 0,-3 will get you into the cell with editor ID SiegeStart; the rest are named Wilderness, just like many of Tamriel's cells. The world consists of 26 cells, which are highlighted in green. The worldspace consists of a large, walled-in area with multiple short walls inside. There is nothing of interest there. This worldspace contains a number of cells, just as Tamriel does. To reach these cells, type cow CWTestHold x,y into the console. There is a large number of Wilderness cells, which are all empty; the others are mostly but not completely bare. To enter cell with editor ID TestCWHoldStart, type cow CWTestHold 0,0. The buildings in this worldspace are all far apart and all appear the same, with the exception of a grain mill. To the east is a set of short, stacked walls, creating an odd appearance. There are areas of this worldspace in which not even footsteps make a sound. A dungeon atmosphere room containing several crafting tools and containers with a collection of all items in the game. 2 Alchemy Lab, 2 Arcane Enchanter, Blacksmith Forge, Anvil, Grindstone, Smelter, Tanning rack, Cooking Spit, Pot and Workbench. "All Ammo", "All Books", "All Clothing and Jewelry", "All Enchanted Armor", "All Enchanted Weapons", "All Ingredients", "All Keys", "All Misc Items", "All Potions", "All Scrolls", "All Skill Books", "All Soul Gems", "All Spell Tomes", "All Staves", "All Standard Armor", "All Standard Weapons"
Furthermore, you can find a table with three wooden ladles lying on it near the end of the main corridor. With the Dawnguard add-on, an extra hall with two containers labeled "All Dawnguard Misc or Other Items" and "All Dawnguard Weapons and Armor" is added. You can go through the end of the main corridor to get there. Dragonborn expands two new cells in the north. "All Dragonborn Keys", "All Dragonborn Spell Tomes", "All Dragonborn Scrolls", "All Dragonborn Books", "All Dragonborn Misc Items", "All Dragonborn Potions", "All Dragonborn Ingredients", "All Dragonborn Armor", "All Dragonborn Weapons", "All Dragonborn Ammo"
You can also find a small deep pool (presumably to test water walking) and four practice dummies. There are two activators near the door to the second cell. Activating the left button will teach you all words for shouts added in Dragonborn. Activating the right button will teach all spells added in Dragonborn. Both buttons can be activated only once. †Only appear in test cell. ‡Probably a bug. A bristleback is a boar, while a fire wyrm is a spectral dragon. All spawned creatures have common loot. Spawned creatures may get out of the cage as long as their sizes allow them to cross the door. Spawned frost giant won't drop Paragon. Spawned fire wyrm won't turn hostile to you. This worldspace contains a large number of cells, just as Tamriel does. To reach these cells, type cow FXLightWorldSpace x,y into the console. All of these cells are empty and are nothing but land. To enter one cell of this worldspace, type cow FXLightWorldSpace 0,0. This interior cell, added by Dawnguard, is set up like a stone fortress. Behind the entrance is empty space. There are Ancestor Moths in the middle of the main room, with three locations on the ground where they can land. There is nothing of interest up the stairs. A leveled melee bandit stands next to the doorway, through which there is a small room. Embers float next to a broken part of a wall, which leads to a dirt tunnel with wooden support beams. The tunnel ends in nothingness. This interior cell, added by Dawnguard, is set up like a stone fortress. Behind the entrance is empty space. In the middle of the main room is a weak test vortex with a number of items in it—four Iron Daggers, two Hide Shields, two Deathbell flowers, one Daedric Greatsword of the Inferno, and four bloody human leg bones. In one corner of the room is a test Storm Atronach (level 30), but it is disabled and does not appear. There is nothing of interest up the stairs. Through the doorway, there is a small room with floating embers next to a broken part of the wall, which leads to a dirt tunnel with wooden support beams. The tunnel ends in nothingness. The vortex and atronach both have "test" and "Phil" in their editor IDs, showing that they are specifically test objects and possibly made or used by a guy named Phil. This interior cell is huge, with stone walls. Throughout it, there is the sound of bells. The southernmost room, in the southeast, tests mist. Heading through a short hallway north, the next room has more mist and a jet of steam. The next room, to the west, contains no mist but a test HDR box that appears to have multiple color bars on it of varying intensities. Heading through a misted hallway to the north ends in a room with a test white light, two unusable doors (one unsupported), a barrel of food, a few ice spikes on the floor, a static light spell in the west, and a Circle of Protection near the middle. There are two doorways to the north of this. The hall through the left one has gas traps throughout, as does the resulting room, which is the center of a set of three. It contains Hide Armor of Minor Health. The cell to the left has test violet light and static test lightning; in its southwestern corner are two food barrels, some ice spikes on the ground, some fire effects, and test blue lighting. The third of the rooms has test particle lighting, test blue lighting, and the light of a magical fire barrier. Its southern door leads to an unconnected room in the same cell that looks like an inn's common room. In the middle is test bounce lighting and to the west is test candle lighting. The campfire light is a test as well. Also in the room are an Iron Mace and Iron War Axe of Embers. Heading back to the three side-by-side rooms, each of them has a door heading north to three side-by-side hallways. The easternmost of these is a dead end and does not connect to the other two. It contains another test HDR box, two downwards frost rune traps, one sideways fire rune trap, and one downwards lighting rune trap. It has the light from a magic barrier on top of fire effects. In the middle hallway, which is misted, there are some soul gems sticking out of rocks near a static Sphere Centurion. There is oil on the ground. There is a test orange light near the ground (this one including the name "Cory" in its ID), and there is a test ray of sunlight near the end of the hall. The left hall has test candlelight and another static Centurion, which is holding a candle in its left hand, with oil on the ground but no fog. There is nothing beyond the end door of this hall. Through the doorway at the end of the middle hall is the northernmost room. There is a house on the left side with no door or entrance. There is an oil slick on one side of the house and another near the entrance the room. There is a fire pillar with some magic fire light effect next to it. Another copy of this light is about halfway between an oil slick and the fire pillar. This interior cell is modeled like a foggy cave. Just in front of the entrance is some fire. In the middle of the den is a large, impenetrable, magical blue barrier. In the southwestern corner is a test campfire. This interior cell is a misty cave tunnel with test rain beams throughout. At the southern end is an oil slick with test orange light above it. Just before coming upon a fiery test campfire, to the east there is a windy branched tunnel at the end of which is an icy wall holding back a large puddle. The northernmost room has test blue sunlight. This interior cell has the same layout as XTestGrantInt, but the northern end in that cell is the southern in this one. It contains test HDR boxes in the same two locations, and contains the same ice spikes on the ground. In the middle of three side-by-side rooms to the north of three side-by-side hallways, there is a test lighting sphere. In the middle and easternmost of these hallways with Dwarven architecture, there are Sphere Centurions. The inn common room is as barren as the rest of the area and cannot be accessed by normal means. This interior cell has a gray stone disk of land in the center. 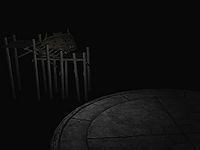 To the north is a wooden dock with a tiny Jorrvaskr merged into it. The northernmost light source is a test inventory light. The cell is very, very blurry and dark, making it impossible to see anything but the disk. A completely empty black cell. This interior cell consists of a small, fully enclosed stone room. A bed lies in the southeastern corner. In addition, there is an invisible object called "Test Click Trigger" that juts out from the southern wall and spans about half of the room. It has no collision, and can only be activated from the eastern side. There are no light sources, but there is enough ambient light to see without difficulty. There is a Blood Portal in the middle of the northern wall. 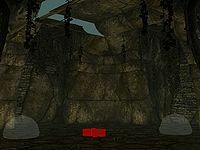 This interior cell is similar to the previous cell in size, shape, and style, but it instead contains two chests opposite each other, to the west and east of where the player spawns. These chests contain a large number of items; they are the merchant chests for the various Quartermasters that can be found in the Stormcloak and Imperial camps. 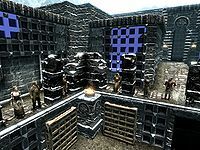 This interior cell, added by Dawnguard, has walls and floors made of lined grids. There are three test swinging bridges in the middle. The eastern wall is gray; the rest are light yellow. There are three huge Greybeard-like test statues in front of this wall. There are three friendly, leveled hunters in this cube. To the north of this cube—not connected to it—is a very small broken room and collapsed corridor with Falmer architecture and ice over it. 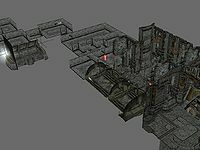 This interior cell, added by Dawnguard, is a collection of three segments of a Volkihar-style castle that are not connected. In the southernmost segment, in the eastern of its two rooms, there is a statue of Malacath on the eastern side. There are a number of stairs in the room, but nothing else of interest. Through a corridor on the western side, the second room may be reached. This room has a few unconnected jail walls, and has a tiny room to the east with three benches in it. The second segment, to the northeast, has a few stone stairs. The floor alternates between stone and wood. The third and northernmost segment contains a number of small, connected rooms. In one of the northern rooms is a statue of Mara, but the rest of the area holds little of interest. This interior cell, added by Dawnguard, is a small, empty room, of Falmer architecture. This interior cell, added by Dawnguard, is a mostly empty Volkihar-style castle. 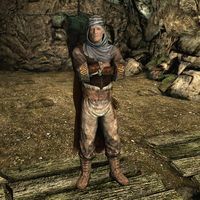 At the beginning however there is a collection of Dawnguard items: a poison bloom, a moon dial, a tonal resonator and an activation altar like they are found in the Inner Sanctum. This interior cell, added by Dawnguard, is modeled like the Soul Cairn. It contains a few mausoleums and teleport locations, with the only crater being at the northern end. There is a harvestable Soul Fissure in the middle of the cell, on which is a Dwemer cupboard containing a copy of each soul gem in the game, including Azura's Star. There are some critters around there, as well. A sideways crater is in one of the mausoleums. 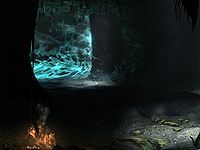 A disabled ambush of Wrathmen waits in the southwestern corner, to the north of which is another cupboard of all soul gems with a lightning attractor next to it. This interior cell, added by Dawnguard, is an unlit, hollow square. Stairways create a square-shape. Under an arch is an Ideal Master Crystal. 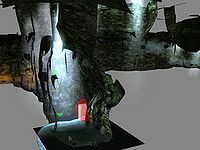 This interior cell, added by Dawnguard, is a mostly unlit cell with a tiny mound of dirt for the player to stand on when reaching it. The rest of the cell consists of a small variety of walls, all next to or on top of each other. This interior cell, added by Dawnguard, is mostly empty. It has four connected rooms with a small set of hallways connecting them from other sides. All of the rooms have a doorway into emptiness. There is torchlight in the easternmost room and more torchlight in an inaccessible square of nothingness isolated by the hallways. This interior cell, added by Dawnguard, is set up much the same as the cells named Its baaaaaack. On a stone near the entrance are a number of caveworms, underneath a partial Falmer bridge. Three Falmer tents, two large and one small, are around the sides of the room. Next to the entrance is a mineable Shellbug, which will die after being used. A Falmer totem and two Falmer jugs are also in the room. There is nothing of interest up the stairs. Through the tunnel where the other cells meet a dead end, there are more caveworms. At the end is a set of hanging bridges. On the ground is nothing, but in the sky is a floating island. 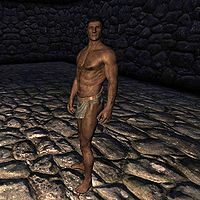 On it is a Nord man dressed as an Alik'r Warrior who sleeps in Psijic clothing. His name is TestCarryFirewood. This interior cell, added by Dawnguard, is set up exactly the same as TestBrieDLC in terms of the basic environment. At the southern end, just off the ground, is a trigger for Arvak to run around. In the middle of the first room is a Reaper. 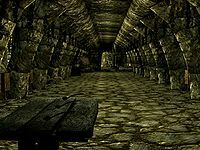 This interior cell, added by Dawnguard and not to be confused with the cell that's actually named TestTony, has the same setup as the previous two cells but lacks the tunnel system and anything past it. In the middle of the room is an Ideal Master Crystal. 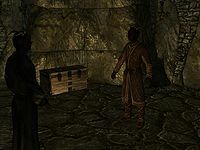 To the right of it are two Elder Scrolls (one an activator and one the dragon version), a noninteractive chest meant for holding an Elder Scroll, and two oversized, unusable, floating books. Past the books is a wooden table on which are Soul Gem Shards, an empty bone bowl, two bloody tankards, a bucket of blood, a torture tool, a Dwemer schematic, an Initiate's Ewer, a Potion of Blood, Katria's Journal, Notes on Dimhollow Crypt, Vol. 3, The Aetherium Wars, Venarus Vulpin's Research, Journal of Mirtil Angoth, and Unknown Book, Vol. III. Around this table are three Bloodstone Chalices: one empty, one with blood, and one full. On the ground on the other side are Purified Void Salts and Finely Ground Bone Meal. To the north of the large books is a Falmer chest. To the north of this is another chest, to the east of which is a third chest in another style. To the north of the crystal is a crater. To the west are four small crystal pillars. In the northern part of the room are four coffins, two lying down and two standing up. There is also a night power shrine and a blood magic shrine. This interior cell, added by Dawnguard, looks like a Nordic barrow. There are three trap pressure plates in the first room of the eastern segment. 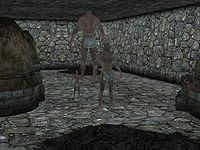 On the eastern side of the room, there is a white stone mound from which a leveled Draugr emerges when the glowing pillar (named Locked Sarcophagus) is activated. There is a pull chain just to the north of this, linked to a barred door on the western side of the room. The chest is like a regular boss bandit chest. Through the northern tunnel is another room, which has two giant rain barrels filled with blood. On the southern side of the room is a stand with four blood-filled kegs on it, across from stairs leading nowhere. There are three leveled draugr in here. The western segment is not connected to the eastern. At the southernmost end, there are two levels. The top is simply a hanging wooden bridge. The lower level is all water. Swimming north, there is a low mist, and there are test rapids from Dawnguard. At the northernmost end is a waterfall that ends in a pool. This worldspace, added by Dawnguard, contains a number of cells, just as Tamriel does. To reach these cells, type cow TestMeganWorld x,y into the console. Most of these cells are empty and are nothing but land; all are Wilderness cells. To enter the main cell of this worldspace, type cow TestMeganWorld 0,0. The other two cells with content exist at coordinates (-2, 0) and (-1, 0). Part of this worldspace is modeled like Blackreach; the other part is not like anything else in-game. The non-Blackreach segment has some Yellow Mountain Flowers, a Canticle Tree, and two geysers. A Soul Husk sample and three Poison Bloom samples lie in one area next to a few tombstone and standing stones. The Blackreach segment has a few stones, mushrooms, and a mushroom tree around a short pathway. This interior cell, added by Dawnguard, is modeled like the inside of Forgotten Vale's Inner Sanctum. There are four segments: a hallway to the west, a room to the east, some corridors and a room in the middle of those two, and a room to the northeast. The northeastern room and western hallway are not connected to anything else. All of them have a low mist but the northeastern room. The western hallway is empty. The western room has an iceberg on top of it, with some large icicles visible through the ceiling. The middle segment has some broken pillars in its room. The northeastern room has a wayshrine in it. 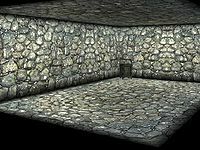 This interior cell, not to be confused with the cell added by Dawnguard that has an editor ID of TestTony, is a rectangular stone room. It has three forges, each with a pile of coal. At each forge is an NPC shoveling the coal. The NPCs are named TestJeremyRegular, TestJeremySmall, and TestJeremyBig. If their work is disturbed, say by an attacking player, TestJeremySmall will shrink and TestJeremyBig will grow. 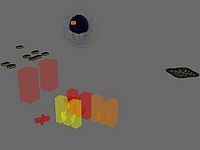 Their purpose, and the purpose of the cell, appears to be to test the effect character size has on certain animations. 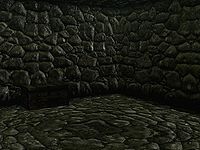 This interior cell, added by Dawnguard, is a small room with stone walls. In one corner is a table. On this table is a rune shield, the book Confessions Of A Khajiit Fur Trader, a rune hammer, a rune axe, vampire gauntlets, and an Amulet of Bats. There are no spiders. This interior cell has no ground to stand on. In front of a black plane is a bronze dragon in a pose with scenic lighting. Behind that plane is Potema's Skull, which can briefly be seen falling into the void in-game, and a few static objects, presumably placed to test the way objects in the loading screen would look. This interior cell is tiny and lightless, holding a Werewolf model. These are small rectangular rooms with stone walls which are empty except a possible NPC. A female Dunmer called Azura with editor ID DA01AzuraVoice resides here. A male Imperial called Molag Bal with editor ID DA10MolagBalVoice resides here. Warehouses exist for the purpose of having a collection of similar things in one place. They make it easy to copy certain things such as ambushes and bookshelves. 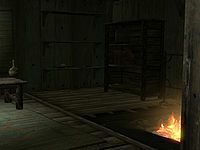 This interior cell, added by Dragonborn, contains a number of Rieklings along with some locations for them to perform certain actions such as dancing. This interior cell contains two pickaxes and a number of Rieklings preparing to ambush. This interior cell contains two Riekling containers and two Rieklings. This interior cell contains a pickaxe, lots of spiders, lots of veins to mine, and a number of spider eggs. There is one room, along with five floating platforms not visible from that room. This interior cell, added by Dawnguard, has three Chaurus cocoons in the southern end. On the western side of the room, a leveled Chaurus Hunter will attack from a cocoon. Another will attack from a Falmer wall pod. Just to the north of this, a Frostbite Spider will attack from the ceiling. To the northeast, a Draugr will attack. On the eastern side of the room, there are four side-by-side ambushes: a Wrathman, a Mist Man, a ranged Boneman, and a melee Boneman. The northeastern corner of the room has purple light but is not special. This interior cell, added by Dawnguard, has two triggers in the southern end for Arvak to appear. North of them is a Soul Cairn crater. To the northwest of this is a set of caveworms. In the middle of the eastern end of the room is a Falmer wall pod with a ranged Falmer in it and a cocoon with a Chaurus Hunter in it. This interior cell holds a very large number of civil war guard templates, along with their attack/spawn spots, phase triggers, and barricades. There are two unconnected rooms with these. Floating in empty space are tents, tables, chests, and other such things that make up a military camp. This interior cell contains two soldiers, two attack markers, and two attack/defend markers. This interior cell is a large, stony rectangle filled with ambushes and with two destroyable spiderwebs in the middle. Starting with the southeastern corner and heading clockwise, the ambushes are as follows: two Draugr in chairs, a Skeleton in a chair, a Draugr in a sarcophagus, two Draugr on the ground, a Draugr in a standing sarcophagus, a Dragon Priest in a sarcophagus, a Spriggan, two Ice Wraiths, a Gargoyle, a Dwarven Spider from a pipe cap, a Dwarven Spider in a sideways pipe cap, a Dwarven Sphere in a centurion port, a Centurion in a Dwemer archway, an Affable Gent, a Chaurus, a Falmer in a wall pod, and a Frostbite Spider falling from the ceiling. This interior cell has a number of bookshelves taking up the entire northern wall. All of the books in the shelves are random, and there are a number of clutter items in between them, such as bones, bowls, and soul gems. There are a few cobwebs. This interior cell has only a few things in it. On the western side is an NPC named TestCarryFirewood, dressed as an Alik'r Warrior. Near him are two wood piles and a lever. At the northern end is a horse trough and another lever. The eastern end has an NPC named TestCarryBasket that appears the same as the first NPC. There are two levers next to him. This interior cell has crafting stations and materials in it. The western side has two forges—one with flames and one without—a workbench, a grindstone, a tanning rack, two alchemy labs and two enchanting tables. There is a wooden table containing one of the alchemy labs and one of the enchanting tables. On the northern side are three cooking pots. On the southern side is a smelter. 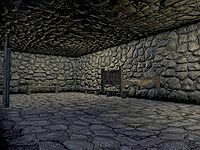 In the middle of the room, creating a sort of eastern wall beyond which is an empty room, is a set of bookshelves holding ores, metal bars, filled soul gems, and blacksmith hammers. This interior cell has various locations and objects in it that NPCs can interact with; the player character may only use a few of them. Scattered about in the middle of the room are markers for all idle activities not requiring an object, such as sweeping the floor or reading a book. At the northern end of the room are piles of chopped wood, a wood chopping block, a log, and two chairs. The eastern side has a counter, a lamppost, a barrel, a woodbeam, and a table. To the south is a small fence, an extinguished campfire, and shackles. The remaining side has a scaffold and a horse trough. In between all these things are a few locations where NPCs can mine, sit down, hammer on, or lean on things. Black Creek, Blackrock Den, Blackscar Camp, Blackwater Channel, Blackwind Spire, Bladeridge Den, Brigand's Bluff, Broadstream Camp, Chillpine Grove, Cloudreach Cavern, Darkstone Tower, Darkthorn Grove, Dawnsgard, Eboncrest, Ebongaze Tower, Eye of Markarth, Forsaken Spire, Glimmerweb Depths, Kyneswatch, Lost Summit Overlook, Northstar Tower, Reachward Watch, Reachwind Eyrie, Rebel's Respite, Rimewind Keep, Riverwatch, Scarred Earth Cavern, Shaderest Tower, Snowmelt Cove, Softfire Camp, Stoneshaper Summit, Stormcrest Tower, Twisted Root Cave, Windshear Post, Windward Spire. This interior cell contains pens that hold test bandits in them. Heading clockwise from the southwestern corner, the pens contain the following: a bandit, a bed, a chair, and a table; two bandits, with the same furniture; a bandit and the same furniture, but with an extra chair and two idle markers; two bandits, with one idle marker at either end of the pen; one bandit with a chair, a table, an idle marker, and a guard marker; and one bandit with a lever and two idle markers. The bandits are not hostile. The lever plays an animation when you activate it to open the test grate. This interior cell is much like the previous. The first five pens are the same. The final one in the previous cell this time has an idle marker and a guard marker. There is also an additional pen on the southern wall, which contains a bandit with four idle markers. The bandits are different than in the previous cell, but they are still not hostile. This interior cell, which lacks lighting, starts out in a room containing weapon plaques and racks along with a number of weapons. There is a torture rack in one corner. To the east are a floating door and banner. To the south is the base for a dragon mound. To the slight northeast of this is a floating word wall containing the first word of the shout Slow Time; there is a door near here. Scattered around to the north are triggers for Random Encounters. To the west is more solid ground. The plane has a Wisp Mother on it, and it contains a ceiling without walls, though the player may not stand on this ceiling. This interior cell, altered by Dawnguard, is a large area that holds traps. Starting in the southwestern corner, there is a spiked wood wall. Stepping on the first pressure plate will activate a crossbow trap. The second will activate the wall. The third will activate a spotlight. The fourth and final one before entering the first room does nothing. There are three more door traps in the next room, each activated by the nearest pressure plate. The lever to the north activates the door trap again. The next pressure plate activates another spotlight. To the west is a plate that triggers a spear trap. The final plate down that side will activate a poison gas. The eastern end of the hallway has another spear trap activated by a plate, and a skull trap that activates based on where the player steps. Heading north, there is a crossbow trap activated by the next pressure plate. The next room has a bear trap, a swinging door, darts, and flamethrowers, but it also has a soul gem, a bow, a steel ingot, and a number of untrapped boss chests. The soul gem is atop a trapped pillar. Of particular note in the room is an NPC named Warehouse Traps Reset Test Guy, who will, if asked, reset all the traps. Heading through the northwest hall, a lever will bring down spears that block your path. The lever in the eastern side of the next room does the same. The lever near the middle brings down a single pole. The northernmost level will activate sideways poles. The eastern poisonbloom trap releases poison gas; the western one does not. The room to the west has purple vines on the floor and wall, and another nonfunctional poisonbloom. The lever will lower the rods around the pedestal, allowing one to take the normal apple. To the south, there are two levers; the one on the western wall lowers rods leading nowhere, while the one in the middle lowers the poles around another pedestal with an apple on it. The northwestern room of the cell contains a single lever, which activates another apple on a pedestal situation along with opening each of the doors and activating a bridge leading nowhere. Back in the room with the NPC, there is a northeastern hallway. The hall itself lack traps; the place it leads doesn't. Heading east, there is a flamethrower, a thresher, a long-distance ballista, a Falmer wall trap, and another thresher. The end room has a flame pillar. Going back to the parallel north-south halls branching off of the east-west one, the easternmost has two threshers in it, with two levers to stop them. The next hall has two nonfunctional pressure plates. t the end of the third is the ballista. The final hall has another nonfunctional pressure plate and a moving wall. Another room to the west has a swinging door. The third and final exit from the room with the NPC is to the east, down a wooden ramp. There is a dead Skeever on some wooden spikes. The circle in the middle is a trap that can be activated by the northwestern lever and pressure plate. The two pedestals in the north have spear traps. The eastern side of the room has four rune traps in it. There is a swinging blade in the middle of the three southern alcoves. The eastern alcove has a battering ram. The next room to the east has a large oil slick. To the south are a gas trap and a dart trap. To the north are two fire plates—one functional and one safe—and a beehive. The next room has a wall trap, two bear traps, a hanging bone chain, and a bone chain on the ground in the north. To the south is a mammoth skull trap, along with a short tunnel containing a rockfall. There's another rockfall in the eastern side of the room. Heading east, the rest of the traps are magical pillars with soul gems. The final room, to the north, has a nonfunctioning pressure plate and two battering rams. 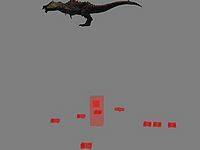 Some of these cells were likely intended to be implemented in the game, but were left unfinished or were never connected to the world. Others have various uses. An alternative version of Bleak Falls Barrow, very similar but both zones merged into a single cell. An unused area of Castle Dour. It is entirely complete, and seems to have been intended to play some role in the Battle for Solitude. The tower is a small two-level room and is fully furnished with an entrance on the lower floor and another on the upper floor. It appears the tower was meant to connect from a now-hidden door in General Tullius's room in Castle Dour to an unused door on the roof of the castle. Leftover code suggests it was possibly an escape route for Tullius, culminating in a final showdown on the roof of the castle. A "Key to Castle Dour Tower" remains in the game, but is also unused. This interior cell, added by Dawnguard, is a small cave. There is a small path leading down to the main portion, a semicircle of land. On the flat side of this semicircle is no wall, but there is a skeleton, Draugr Armor, and a Draugr Greatsword on a floating rock not far away. This interior cell, added by Dawnguard, is a lightless cave with two Bonemen in it. There is a campfire in the northernmost section. Three identical-looking cells that are not connected. They appear as the inside of a small house. The only door can be activated, but doesn't lead to a new cell. A few rare books and notes can be found on two shelves. Judging by the names of the location code, this was probably related to vampire quests that were not released in the final version of the game. A small room with a bit of furniture, and a one-way door leading to Helgen. An ice cave with no exits containing Ice Wraiths, a Frost Atronach and a chest. A small room with a bit of furniture, and a door leading nowhere. This interior cell in the style of Cidhna Mine contains tunnels, Dwemer architecture, some levers and gates, and a few corpses. A Scribbled Note can be found here. This seems to be an unused alternative to the Pelagius Wing BluePalaceWing01 actually used for the quest The Mind of Madness. It is rather large, including an "outside" area with trees. At one place one can play a game of memory by activating "Match Cards" that turn up as either "Clubs", "Diamonds", "Hearts", "Spades" or "Sheo". After removing successfully all five pairs a gate opens. This cell is a small house connecting to The Mind Of A Madman visited during The Mind of Madness. It can be entered through a free-standing door east-northeast of where Sheogorath stands, but invisible walls prevent the player normally from getting there without console use. The other door of the house connects to the cell below. An unfinished cell in barrow style, with parts floating in the air at strange angles. Another small room with a bit of furniture, and a door leading nowhere. This interior cell contains an Urchin and a Courier, along with a barrel holding courier items. This cross-shaped interior cell has two coffins and a fake version of Malborn. A script sends certain NPCs here when they die. The script is activated as soon as the NPC is marked dead, even if one is resurrected by recycleactor. The NPC will be alive in this cell and to never return to Tamriel if resurrected this way. There are doors at the end of each arm of the cross that lead into empty space; walking through one will cause you to fall briefly before landing back in the cell. This exterior cell, in the worldspace WindhelmWorld at coordinates (33, 10), is empty space that was meant to be outside the building around which Windhelm's arena, The Pit, would have been centered. This worldspace contains a large number of cells, just as Tamriel does. To reach these cells, type cow WindhelmPitWorldspace x,y into the console. There was meant to be an arena in Windhelm named "The Pit" in the game, with quests and related NPCs set up for it, but it was not implemented; this is that area. To reach the entrance of the Pit, type coc WindhelmPitEntrance which is located at 33,10. There are Pit Fans gathered around the arena. There is no entrance to the building, and the rest of the worldspace is empty, snowy wilderness. The following images for map markers are not used in the game. They can be selected in the CK by the names given below. Several names for map markers that didn't get used in the end can be found at the map marker warehouse. A few cells that apparently weren't meant as regular content at first were actually placed in-game, almost all appearing as regular Wilderness cells.